After mediocre feedback to the leaked Microsoft Pink handsets, Turtle and Pure, now comes word from inside the project itself that the whole house of cards may be close to tumbling. An ex-team member has been talking to Apple Insider about the Pink “skunkworks” project and its mismanagement, including attempting to develop too many SKUs simultaneously, potentially misleading hardware and carrier partners, and in the process pulling the rug out from the already-ailing Windows Mobile. In fact, he reckons the Pink project is “near death and probably will be canceled”. We were recently contacted by a source with a seemingly exhaustive knowledge of Microsoft’s Project Pink, and what they’ve shared with us doesn’t sound good. If what they’ve shared is true, it seems that the project as a whole began — and will likely end — in vain. The Wall Street Journal is also negative about the whole thing, leaving the Microsoft press unable to spin very much. Even CNET mocks the poor product. Microsoft Corp.’s (MSFT) line of smartphones equipped with an upgraded version of its Windows Mobile software won’t do much to shore up the company’s position in the hyper-competitive smartphone market. Blodget argues that Microsoft should acquire RIM (as though it never acquired Danger). This was pondered before and it makes little practical sense. And here comes the bomb. 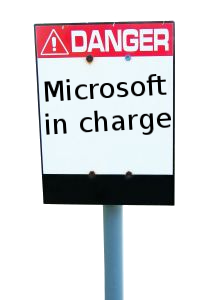 Microsoft may have acquired Danger, but only now does it justify the brand name. The service collapsed in Microsoft’s hands, leaving the carriers to apologise for something that’s probably not their fault. A top exec for T-Mobile has offered an apology and a credit to U.S. Sidekick users, who are still dealing with the effects of a massive data outage that first hit late last week. However, more than a few Sidekick owners just want their contacts, e-mail, and Web browsing back already. This is a moment to remember. It is a moment to “get the facts” — so to speak — and remember why the London Stock Exchange dumped Windows for GNU/Linux. All I know is, you Microsoft guys had better not send this player out again as refurbished. And fix the Zune HD’s glitches faster than you did with the Xbox 360, a game system still suffering from a ridiculously high return rate. There is nothing truly awful about the Zune, but there is nothing great, either. It works well enough and looks OK, but its appeal is limited by mediocre software and online services – handicaps that the Zune’s big competitor doesn’t suffer. How much is Microsoft willing to lose before it calls off the Zune? Xbox 360 is also in the gutter. Sales for Microsoft Corp.’s Xbox 360 stayed tepid in Japan in the latest retail data. Media Create Co. on Fri. reported that the Xbox 360 sold 4,854 units between Sept. 21 to Sept. 27 to rank No. 5 in overall hardware sales.